Drainage systems: It is very rare in the HVAC industry that a very simple part, worth only a few dollars, can avoid so much trouble in a home, save people thousands of dollars and be a valid solution to a health hazard common to all air conditioning units during the monsoon season. What is the cause of this health hazard and the reason for many system failures? The accumulation of rain water in the drain pan of an A/C unit. Our HVAC company operates in Tucson and Southern Arizona, where the monsoon season takes place between June and September. in Arizona, system failures are often caused by the unrelenting heat. But we also receive calls from homeowners whose air conditioning systems fail due to humidity. Condensation from the evaporative coil accumulates at the bottom of the A/C unit. If there is a condensation line blockage the humidity can result in massive water damage. When the atmosphere is hot and humid, the amount of water dripping into to the condensation pan (or drip pan) increases beyond manufacturer specifications. This water needs to go somewhere because it does not just evaporate: it must drain out. Air conditioning units are either “draw-through” or “blow-through” systems. Air is either being pushed (blow-through) or pulled (draw-through) over the coil which cools or heats the house. When the condensate does not drain out, problems pile up. The condensation and subsequent humidity stay within the evaporative coil housing. A/C systems are not designed to maintain stagnant water. As a result, the system can start to incur major damages aggravated by the wide variations in temperature and the resulting corrosive effect on metal. As the air conditioning unit runs the evaporative coil is also collecting particulates that find their way through the system’s filtration. As condensation builds, it runs off with these particulates. They find their way into the condensation pan. If large enough pieces of debris accumulate, over time, blockages can occur. The resulting condensation can overflow the pan causing major damage to the home. When day temperatures reach into the 100°F and there is no A/C in a home, the heat quickly becomes intolerable. Senior citizens and patients with critical illnesses such as multiple sclerosis are immediately affected by a temperature increase of just a few degrees. Even when an HVAC service technician arrives within the hour of an emergency call, the time required to fix a complex system failure will be way too long for the homeowners’ comfort and health. Moreover, the cost of repairing an A/C system crippled by water damage runs into thousands of dollars in parts and labor. This expense is avoidable. Both issues may be avoided by installing a simple part called EZ Trap, at the bottom of the evaporative coil. The EZ Trap and Overflow Sensor is a J-shaped PVC pipe with a clear middle part. Its function is to keep airflow tight and to allow the condensation to flow out effectively from the drain pan. 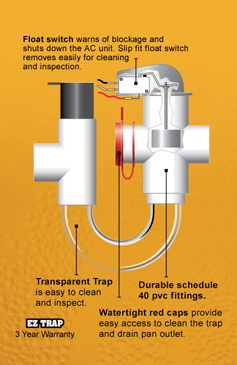 The EZ Trap system uses a float switch which is activated when the pipes are clogged. Water backs up elevating the switch that turns of the system. This prevents overflow and possible water damage. Condensation-related problems do not stop here. When water cannot drain out of the bottom pan, it can become contaminated. Contaminants become airborne when air within this compartment is circulated through the system. What is the contaminant? Mold. Multiple medical and governmental studies have shown that mold causes respiratory diseases and other health issues. According to the Centers for Disease Control (CDC) and the Environmental Protection Agency (EPA), all mold and moisture problems should be treated with the same care and urgency. Among the symptoms of “Sick House Syndrome” (a house with a serious indoor air quality problem): headaches, nausea, watery eyes, skin irritation and fatigue. Health hazards, discomfort and repair costs can be avoided by maintaining system integrity with the installation of an EZ Trap and Overflow Sensor. D&H Air Conditioning & Heating systematically verifies that our clients’ units are equipped with properly fit drainage systems. Our Guardian Maintenance Plan takes care of this before it becomes an issue. We encourage all homeowners in Tucson to call their favorite HVAC contractor and request the installation of an EZ Trap.